Close-up astrophotograph of Comet Lovejoy. Credit: Paul Stewart. 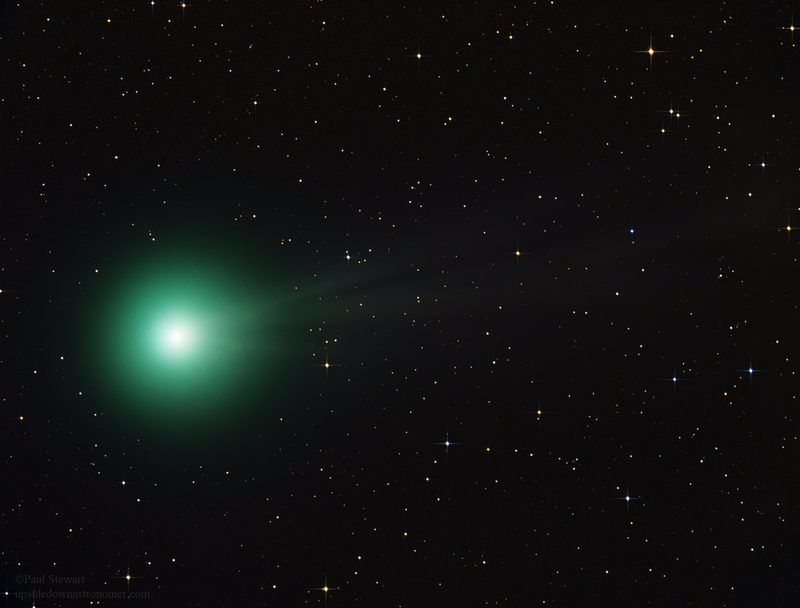 This is Comet C/2014 Q2 (Lovejoy). Like many comets, it has a bright green color due to the fluorescence of diatomic carbon molecules in its tail, broken off from its surface. And most notably, Comet Lovejoy is visible to the naked eye in the northern hemisphere. Northern hemisphere skywatchers have had bad luck with comets. There hasn’t really been a good comet to see here since Comet Hale-Bopp in 1996, while the southern hemisphere has had several. In fact, I don’t remember any other easy-to-see (far from the horizon) naked-eye comets here in the United States except for Comet Holmes in 2007. Chart created by Heavens Above. To the left of the image is Taurus. 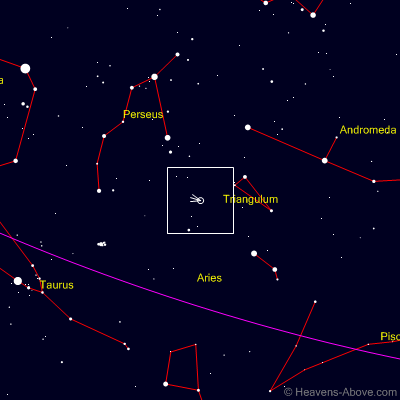 Look to the right of Orion, and you’ll see the bright orange star Aldebaran in Taurus. Follow that line further and a little bit up, and you’ll see a tight cluster of several stars: the Pleiades. And keep following that line further, as far again from the Pleiades as the Pleiades are from Aldebaran, and you’ll see Comet Lovejoy–at least for tonight. It’s moving fast. Look for the little green dot. Stars are never green, so if you find a green one, you’ll know you have it. Naked-eye comets are rare, and this one will be here only a little while longer, so go out and see it while you can. This entry was posted in Comets, Stargazing and tagged comet lovejoy, comets, naked-eye comet. Bookmark the permalink.